TaskRabbit, the collaborative consumption service that allows you to post tasks and have other (vetted, background checked) people complete them within in a short amount of time has finally come to iOS this morning. In case you missed it, TaskRabbit is an ideal service for urban dwellers who are too busy to complete day-to-day tedium like build desks, pick up party platters or fold laundry for example — a perfect market fit for iPhone users, hence. Previously available only on a mobile site, the TaskRabbit iPhone app is actually innovative, allowing anyone who needs something done fast to post a task quickly by either saying, typing or taking a picture of the task they want completed. 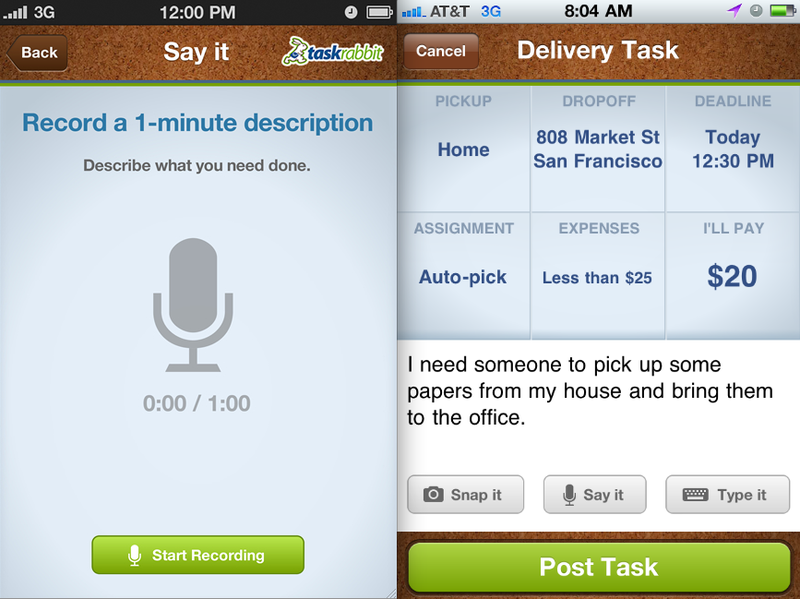 With the TaskRabbit iOS app a user can post a task to the site within a couple of clicks, as cliché as that sounds. Seriously if you’re a TaskRabbit user you should try it out, because it’s pretty impressive. Too lazy to type in your credit card number? You can take advantage of your iPhone camera and take picture of your credit card to pay. Yeah. Task posters can use the Lazy Susan-like interface to choose from task categories like Cleaning, Donations, Shopping, Food Delivery, Cleaning, Donations, (Regular) Delivery and the ever-vague Something Else. The app uses location to figure out the pick up and drop off coordinates for tasks. It also includes an entirely new TaskRabbit feature, “Pricing History,” which averages out prices paid for similar tasks in order to make task pricing decisions easier for those with little time to decide. On the other side of the equation, task runners (Rabbits) who want to use the app can select tasks they’d like to complete by using the “Browse tasks around you” feature, using the iPhone’s GPS to find the most relevant tasks. TaskRabbit recently brought in $5 million in Series A financing from First Round Capital, Baseline Ventures, Shasta Ventures and others in order to hire engineers to build um, apps exactly like this one, no? 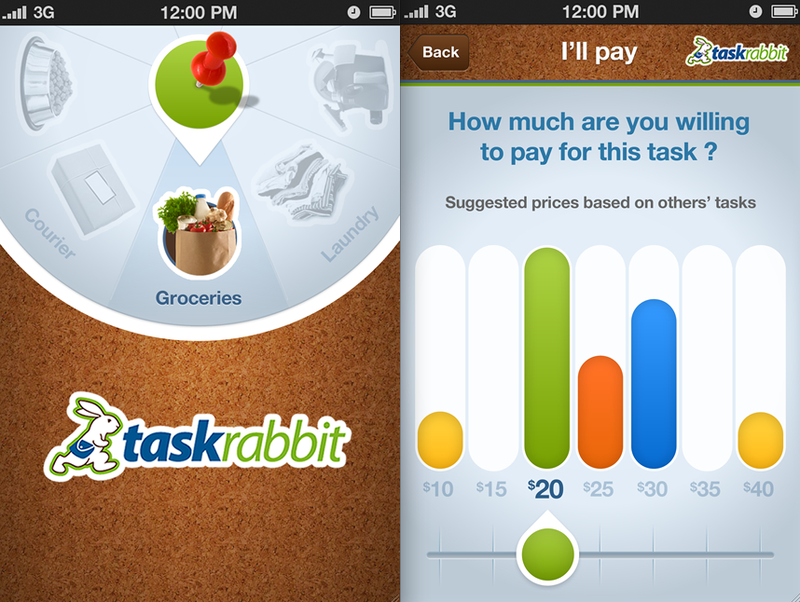 TaskRabbit currently has about 3000 tasks posted each month with an average spend of about $30 per task, taking a 15% cut on average. Recently expanded to Los Angeles and Orange County, the company has its sights set on New York next, like everybody else.